Every day, millions of people search the internet for information. As a result, SEO article writing and submission has become a fast-growing part of internet marketing campaigns. SEO article writing is a potent way of providing your prospective customers with the information they need to make a buying decision. Today’s consumer is more sophisticated than ever before. They are more resistant to traditional types of advertising. Instead they want to be informed, openly and honestly. As well as delivering a powerful message, article submissions increase your professional standing. A well-written and informative article clearly demonstrates your knowledge and understanding of the subject. In time, you are perceived as an expert in your field. And people want to work with experts and buy from them. Article creation and submission is an important part of your SEO campaign. If you want to keep your prospective customers informed, we’ll be happy to advise you. You can give us a call at SEO Service Pros on 0845 601 2237 or alternatively, send your enquiry via our contact us page. Article creation takes time and skill. What do you write about? How should your SEO article be written? Do you need keywords and how often do you use them? Instead of struggling to write an SEO article yourself, our copywriting team can help. They are experienced in writing potent SEO articles for all types of industry sectors. And, the better your articles, the more successful your campaign. SEO articles are written for dedicated websites. These sites are highly optimised, so your online articles have the best possible chance of being indexed by the search engines. This means your article is found by people searching online. They in turn, may share the link to your articles. 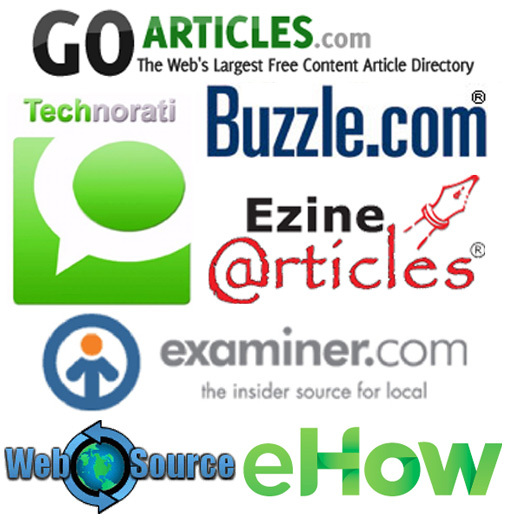 Each article site, such as Ezine and eHow, has different criteria which needs to be met when posting articles. If your article doesn’t comply, it won’t be accepted. Before you can run an article submission campaign, you must first research suitable sites. Once you have selected your target sites, you need to observe their conventions and finally, write your articles accordingly. Like directory listings, article submissions should be made manually. Articles posted online using submission software can’t be modified or have different categories selected. Manual article submission gets over this problem, which is why we recommend it. When you use an SEO article submission service, all this is done for you. Experienced professionals submit the articles on your behalf. They ensure all host websites’ standards are met and your articles have a better chance of being accepted. Do you have time to spend submitting your own articles? If you don’t, an article submission service is the answer. There’s no doubt posting SEO articles online enhances your reputation. But it also contributes to your SEO by providing a valuable source of backlinks to your website. If you need some help with your article creation and submission, why not speak to us here at SEO Service Pros? We can deliver a full service or simply provide the help you need, when you need it. Speak to us today on 0845 601 2237. Alternatively, send your enquiry via our contact us page for more information.